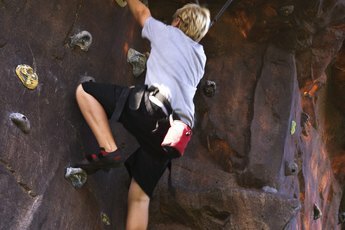 Strengthening your leg muscles will make you a better hiker. Hiking is an enjoyable way to experience the beauty of the outdoors and get in shape at the same time. In addition to improving cardiovascular function by enhancing the capacity of the heart and lungs, hiking is an effective way to develop and tone the muscles of the legs. Adding leg conditioning exercises to your fitness regimen will make you a stronger and more efficient hiker and make your experience of nature all the more enjoyable. The legs comprise multiple layers of muscle. Some muscles are more superficial (easily seen by the eye) and others run deeper into their attachments to the skeleton. 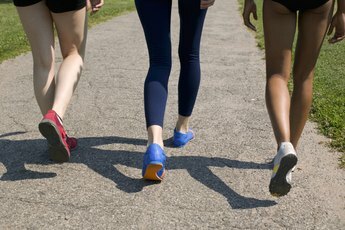 For a comprehensive view of the legs and how they function, it's important to factor in the glutes and the hip flexors -- the muscles at the top of the thighs that lift the legs forward and back -- when designing a conditioning program aimed at improving your hiking skills and stamina on the trails. The glutes are powerhouse muscles capable of propelling the body forward; by actively engaging them and working them in tandem with the leg muscles -- primarily the quadriceps, hamstrings, adductors, abductors and calf muscles -- you will see global improvement in strength and a leaner tone and shape to your legs. For many hikers, taking to the trails means lots of uphill grunt work followed by periods of downhill -- which in some cases can be just as taxing to the leg muscles as hiking uphill. Because most hiking terrain varies in this manner, it's important to strengthen the muscles that will get you up that steep incline and then help you stay upright and balanced as you navigate the downhill portions of the trail. To work the quads, hamstrings and glutes, few exercises are as effective as the basic squat. Stand with your feet a tad wider than shoulder width. Point your feet forward or, if it's more comfortable, slightly turn out your feet. Raise your arms to your sides and make sure your shoulders aren't straining upward toward your ears -- in other words, drop your shoulders. With your gaze steady in front of you, drop into a squat position, keeping your knees in front of your ankles. As you raise back up, actively engage your glutes in addition to your quads and hamstrings. Lunges are also important. Stand with your feet at shoulder width and place your hands on your hips. Step forward with your left leg first and, bending your knee until it's at a 90-degree angle, dip into a lunge position. Using your leg muscles and glutes, slowly push back to the starting position. Lunge with the other leg and then switch back and forth. Squats and lunges also work the calves and impart a lovely shape to their structure. Stabilizing the entire quad and hamstring region in a balanced manner will further stabilize the knees -- and you want your knees to be in good shape as you hike downhill, otherwise you could lose your balance or tweak the delicate knee joint. Squats will strengthen the supportive muscles of the knees, as will simple stair climbing. 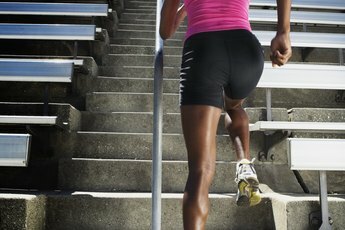 Practice going up and down stairs in a steady, controlled manner, engaging not only the leg muscles but also the glutes. For even better balance, work your core abdominal muscles with slow, metered situps designed to strengthen your middle section, which in turn will strengthen your entire body.